Thank you for the $10 gift card. I am pretty happy to win something. I am already following Jennifer Faye's and Elle Boon's Amazon page! On Aug 12, 2016, CrystalBee said: So many new to me authors! I've added Nancy Naigle and Nina Crespo. I already follow several on Amazon - Jennifer Faye and Nancy Naigle are just a couple of them. I love these scavenger hunts! I was already following several of these authors: I love so many of them. I found many, many additional authors to follow (as I always do at these events). A few of them are: Nina Crespo, Lee Ann Hallane, Pauline Creeden (an old favorite, but I wanted to mention her), Carol Ann Moleti, Catherine Bruns, and Elle Boon (another long-time favorite). Thank you for another great event. As always the hunt was fun. I like this method. I didn't really find any new authors but I found that 2 of my fav authors...Elle Boon & Sam Cheever... have some great releases out. I'll be adding them to my TBR list. I am following Jennifer Faye and Nancy Naigle. I'm following Linda Mercury & Pam Binder but not in a creepy way :), on Amazon! On Aug 10, 2016, ELF said: Thanks for the fun hunt! I haven't signed up to follow anybody new, but definitely have found some new titles I want to read. I appreciate the authors' generosity in sponsoring the great prizes! I'm following Ravenna Tate and Jennifer Faye on Amazon. On Aug 09, 2016, texdd said: Great Authors! I follow Nina Crespo, Jennifer Faye, and Pauline Creeden. Thanks for the giveaway! On Aug 08, 2016, Olivia said: Awesome giveaway game!! I'm following Sam whenever, Jennifer faye, Elle boon! On Aug 08, 2016, sienkielsa said: Great hunt! I'm following Rebecca Rivard and Pauline Creeden! I'm looking to read some new to me authors--Roya Carmen, Carly Jordynn, and Elle Boon to start with. On Aug 06, 2016, Susan Finan said: Awesome giveaway! Thanks so much for the amazing giveaway! I follow almost all of the authors. Rebecca Rivars and Sam Cheever will be the authors to follow. On Aug 06, 2016, Bube said: Thanks for the great scavanger summer fun! Following Nancy Naigle and Nina Crespo. On Aug 05, 2016, tessiekat said: Thank you so much! The Scavenger hunt it so fun!! Thanks for hosting this fun search, found some authors I haven't read before. Rebecca Rivard and Carly Jordynn. They look like authors I will like. Love the Scavenger Hunt! I am following Amy Jarecki and Jennifer Faye on Amazon. Thanks for the fantastic giveaway. These hunts are so much fun. A lot of great authors and books, I've started following Roya Carmen, Nina Crespo and Elle Boon. Can't wait to them.~Stephanie F.
I am following; Amy Jarecky, Carole Ann Moleti, Ravenna Tate, Christina Kirby,... Thank you! Saw only one author that interested me, but I Love these hunts to find other authors I would like to read. Loved the hunt! I'm following Rebecca Rivard and Nancy Naigle. I am following Nancy Naigle and Jennifer Faye. On Jul 31, 2016, DragonStar said: Summer FUN! These hunts really are so much Fun! Thank you for sharing all these new authors. I've followed Christina Kirby, Jennifer Faye, Rebecca Rivard. I am now following Nancy Naigle and Ravenna Tate. On Jul 31, 2016, Gpangel said: Summer Fun! I am following C.M.McCoy and Margaret Mallory. I really like this type of hunting. I am following Jennifer Faye and Gayle Leeson. On Jul 30, 2016, kaisquared said: More great authors! On Jul 30, 2016, BookAttict said: By TBR just grew exponentially! I followed all the authors on Amazon (or wishlisted a book if the "Follow" option was unavailable.) I'm looking forward to checking out books by Nina Crespo, Cindy Skaggs and Rebecca Rivard. On Jul 30, 2016, KatLouise said: Great variety! I found some new authors to check out for myself (Ravenna Tate, Pauline Creeden, Sharon Buchbinder) and some to recommend for readers' advisory at work. Thanks to all for taking a look at my featured title Breakwater Beach! Be sure and let me know how you like it! Thanks for the follows and additions to your TBR lists. So glad everyone is having fun:) Enjoy and good luck! On Jul 29, 2016, Jessica Jones said: FunTastic! Amy Jarecki, Peggy Rothschild, Nina Crespo, Jennifer Faye, Nancy Naigle, Lee-Ann Wallace, Cindy Skaggs, Sam Cheever, Pauline Creeden, Carol Ann Moleti, Catherine Bruns, Elle Boon, Rebecca Rivard, Carley Jordynn, Linda Mercury, Christina Kirby, Roya Carmen, Ravenna Tate, Pam Binder, and Lisa Q. Mathews. The ones that I couldn't follow I put their books on my wish list. I had fun doing this, and have found some new authors that I can't wait to read. I added all the authors but my favorites were Amy Jarecki and Carly Jordynn. I'm following Catherine Bruns and Linda Mercury on Amazon :) Thanks for the chance to win!!! On Jul 29, 2016, Bmore said: Awesome giveaway!!! NOR rocks! Thanks for the great giveaway. I'm now following Nina Crespo and Christina Kirby on Amazon. Thanks for pointing out some great authors .. some I had never heard of but their book blurbs & smoking hot covers ..lol... have grabbed my attention. A couple of new ones I am following are Elle Boon and Lee-Ann Wallace. I have not participated in your scavenger hunt in a long time but in the past always came away with at least one new to me author who would hit my "Must Buy List"... Thanks! I'm looking forward to getting to know the work of some authors I'm not familiar with. On Jul 28, 2016, pansypetal said: New to me . . .
On Jul 28, 2016, amyjarecki said: Wow! On Jul 28, 2016, ktandcamsmom said: Love these scavenger hunts! There are quite a few I'm now following from this event. Here are a few. Pam Binder, Elle Boon,Nancy Naigle,and Amy Jarecki. This was great fun. I am following Pauline Creeden and Nina Crespo on Amazon. The two authors I am following on Amazon are Sam Cheever and Ravenna Tate. On Jul 28, 2016, Shadow said: Thank you! There are so many awesome authors! Following quite a few of them. Some are Sam Cheever, Sharon Buchbinder, Michelle M. Pillow. Thank you! Sam Cheever and Jennifer Faye on Amazon. So many great authors. I'm now following Amy Jarecki and Sharon Buchbinder! On Jul 27, 2016, gecko said: New authors I found! Thank you for offering these great and fun contests! I am now following Nancy Naigle and Jennifer Faye on Amazon. On Jul 26, 2016, Tori V said: amazing giveaway! On Jul 26, 2016, granny said: Fabulous Giveaway!!!!!! This is an awesome giveaway.So many authors and books I haven't read.Found some I really want to read.Thanks for doing this. On Jul 26, 2016, Cozy Heather said: Fun! I am following Gayle Leeson and Lisa Q. Mathews on Amazon. The Calamity Cafe was so fun to read- I was so thrilled to see the cover art for the next book! Looking forward to reading Lisa M.'s series as well. Also found some titles that weren't my style but I will be recommending to friends. I am following on Amazon now would be Michelle M. Pillow and Chance Carter. There are more that I already follow. Two new to me authors I followed are Lisa Q. Matthews and Elle Boon. I plan to check out more of the authors later. Two authors that I am following on Amazon now would be Michelle M. Pillow and Chance Carter. Thanks for another great scavenger hunt. It's always fun to participate. I am following Nancy Nagle and Nina Crespo to name a few. I'm now following Sharon Buchbinder, Linda Mercury, Lee-Ann Wallance, And Amy Jarecki. I love these types of contest because they introduce me to new authors!!! Thank you! I followed Amy Jarecki and Catehrine Bruns. On Jul 25, 2016, SerenaS said: Great titles! I would love to read Chronicles of Steele by Pauline Creeden. I found a few new authors I could enjoy reading. I am not really into the shifters or paranormal,but I do love romance and family stories. Thanks for letting me get to know some of these authors! On Jul 24, 2016, Ahrudd said: New authors! Found 2 new authors to read - Nancy Naigle and Gayle Lesson. I followed Jennifer Faye and Lisa Q. Matthews on Amazon! Nina Crespo and Sam Cheever right now and have for a while. I'm sure there are others I'll find during this hunt. Have a lot of authors to look into. Thank you for the giveaway. On Jul 23, 2016, gsryley said: Thank you. On Jul 23, 2016, nespony said: How fun! Amy Jareki and Pam Binder!! I'm following Elle Boon and Lee-Ann Wallace on Amazon. I'm following Amy Jarecki, Peggy Rothschild, Nina Crespo and Jennifer Faye. I click on link to author's page and I still don't see anything.I am not sure where the blurb is and see no words.Am I blind? I'm following Lee-Ann Wallace and Elle Boon on Amazon. Nina Crespo and Jennifer Faye. I like the sound of both their books! Please keep the scavenger hunts coming. They're lots of fun, and the prizes are great! cokittykat click on the link to the authors page. You will see an image in the blurb section for the featured book. The image has a summer word on it. I click on the books as instructed and no secret word shows up.I don't get it! I am following Nina Crespo and Elle Boon. On Jul 22, 2016, WendyBean said: Add more authors? I discovered a new fave author several months ago when I came across Pauline Creeden's book Chronicles of Steele--what a treat!! Another author whom I'm hoping is added here is Tamara Leigh. I love her stories of love, mystery & faith! I'm following Jennifer Faye and Nancy Naigle. I follow Jennifer Faye (a favorite author!) and Nancy Naigle already! On Jul 22, 2016, Amyburkhart said: New authors from scavengers hunt yay!!! I absolutely love the scavenger hunt! I have discovered several new authors to follow and have added several more books to my growing wish list. Of those authors there is Pam Binder and Lee-Ann Wallace. I can't wait to get reading!!! I am not currently following any of the authors on the list. Will look into these authors, though. I love these scavenger hunts, but they always find me new authors to try and therefore my book allowance goes so much quicker every time you have one. LOL But please don't stop, it is such a great way to find new authors in one place. I see a few I already know, so that helps. This contest is far too complicated for me. At my stage of life things need to be simple.I made a mistake signing up for this. I don't even recognize any of the authors. Sorry for wasting your time with my entries. On Jul 22, 2016, marybelle said: Love this!! Following Sam Cheevers and Jennifer Faye. I read most the authors on this list, but a FEW favorites are Nina Crespo, Linda Mercury, Pam Binder, Sam Cheever, and Lee-Ann Wallace. Thank you for offering us such a fantabulous contest. I following Nancy Naigle and Catherine Bruns. On Jul 22, 2016, melodyk said: Fun in the Sun! What a fun contest. I love sites like these because I am able to discover some really great authors and add to my stack of bedside reads. Following Peggy Rothschild, Pauline Creeden and Cindy Skaggs at the moment. Thanks to the authors and NOR for the "hunt"..
On Jul 22, 2016, malellak said: Thank you! I now follow Jennifer Faye and Peggy Rothschild. Thanks for the giveaway! On Jul 22, 2016, mshigh said: Thanks for this! On Jul 22, 2016, ailiekong said: Thank you! Omg, Thank you for doing this! I'm followed Linda Mercury and Pauline Creeden. If Augustina Van Hoven has a page, I would have followed too!! I follow Pam Binder and Jennifer Faye. Finding new authors are always good. Following Elle Boone now. I am following Sam Cheevar and Lee-Ann Wallace. Thanks for this again. I'm following Jennifer Faye, and Lee Ann Wallace on Amazon. I've also added a couple of books to my book wishlist. Thanks for the FAB giveaway! Always enjoy the Scavenger Hunts. A few new books and a couple of new authors. Thanks or the fun. On Jul 21, 2016, Squenn said: Thanks for the chance! Great scavenger hunt! I started following Nancy Naigle and Gayle Lesson. Thanks for the fun! On Jul 21, 2016, Sylvie said: Love these scavenger hunts! I love these scavenger hunts, because I always find something new, whether a new title, a new author, or a new genre altogether! This time Dose Vidanya by Sam Cheever caught my eye. I love the cover! The Inscription by Pam Binder is especially intriguing. I love time travel! Jennifer Faye and Catherine Bruns. Thank you for this chance! I am following Peggy Rothschild, Elle Boone and Christina Kirby. Thanks for this great giveaway. I'm following Pam Binder and Carly Jordynn! I've discovered lots of authors whose books I want to read! Thank you! On Jul 21, 2016, wakela said: summertime fun! I really loved the scavenger hunt. Since I am on a cozy mystery kick right now, I chose to follow Lisa Q Mathews, Gayle Leeson (as Gayle Trent), Catherine Bruns & Sam Cheevers. This is so awesome, I really find so many new authors that I never would have known about. I'm following Elle Boon and Jennifer Faye. I heard they are both amazing and can't wait to read some of their books. On Jul 21, 2016, Hafowler said: This events CRUSH my TBR list! Following Roya Carmen and Nina Crespo on Amazon! Thanks for the amazing giveaway! I am already following several of the authors. I didn't pick up anyone new. On Jul 21, 2016, pixiestyx said: Love the hunts! I followed Peggy Rothschild and Ravenna Tate on Amazon. Thanks for letting us discover new authors! Now Betty, you have fun at the beach for me! On Jul 21, 2016, MdotDrizzi said: Fun Hunt! Lots of great books and new authors! I am now following Linda Mercury and Carly Jordynn on Amazon. On Jul 21, 2016, shadowwolf said: Thank you! I am following Nina Crespo and Pauline Creeden. Thank you! On Jul 21, 2016, SuzReadsBooks said: Great Contest! Thanks for this amazing contest - I would love to win! I like learning about new authors and books! I'm following Catherine Bruns and Pauline Creeden on Amazon! I'm following Amy Jarecki and Jennifer Faye. I followed Amy Jarecki and Elle Boone on Amz. Found some books from a couple of other authors, as well! On Jul 21, 2016, alisab said: Love It! I love these scavenger hunts AND finding new authors to read. I love these events. I get to read about new releases and add them to my TBR. Thank you for organizing this & the generous giveaways. On Jul 21, 2016, HaddieHarper said: So many great authors and titles! I am now follow Amy Jarecki and Peggy Rothschild. Thanks so much for the chance and a special hello to all the authors who donated to the hunt! Following all Authors on Amazon , Amy Jarecki , Peggy Rothschild.. to name a few ..Added a lot of books to my wish list. Love Elle Boon , Sam Cheever..
New ones Pam Binder , Pauline Creeden, Carly Jordon some New Authors for me. I really enjoy finding New Reads. Thank you for the Event. On Jul 21, 2016, Aleveria said: Scavenger Hunt! I really dig these Scavenger Hunts! Love seeing new and interesting authors too! I'll list Cindy Scaggs & Jennifer Faye as my two participating authors since I read their stuff already. Thanks to you and all the authors! On Jul 21, 2016, evna said: Great contest! I followed Jennifer Faye and Peggy Rothschild! I love these scavenger hunts, they are fun, you find new authors to read and of course the gift cards to keep you in the books you love. I follow Jennifer Faye and Nina Crespo on Amazon. On Jul 18, 2016, Tamazon said: Almost Time! Are you ready to win some Amazon cards? 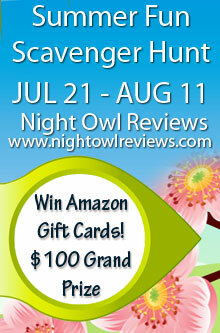 Night Owl Reviews is ready to get you started on another fun event. Thanks to the authors for sponsoring this event.